Sri Ramanuja (1017 - 1137 CE), the most important philosopher-saint of Sri Vaishnavam and one of the most dynamic characters of Hinduism. He was a philosophical as well as a social reformer, displaying a catholicity that was nearly unparalleled in Hindu religious history before him. He revitalised Indian philosophy and popular religion so much that nearly every aspect of Hinduism has been influenced by his work. His life and works show a truly unique personality, combining contemplativ e insight, logical acumen, catholicity, charismatic energy, and selfless dedication to God. His date of birth is placed differently by different authorities.As per PPM, he was born in Kaliyuga year 4119 which corresponds to1017 AD. PPM fixes even the exact date as 13th April 1017 AD, interms of English Calendar. PPM and ATA mention the year as Pingala, month Chitrai and the constellation Tiruvadirai. PPM adds that it was a Sukla Paksha Panchami, a Friday. 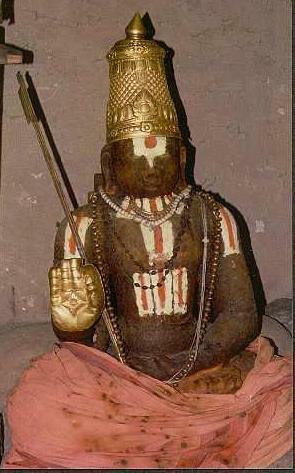 (21) Kulothunga Chola was a staunch devotee of Siva. He commanded Ramanuja to come to his court with a view to enlisting his support to establish the superiority of Siva over all other deities. (including Vishnu ). If the support was not forthcoming, the king was planning to kill Ramanuja. Sensing the danger, Kuresa went to the court disguised as Ramanuja along with another disciple called Periya Nambi. The king ordered him to sign a document to the effect that 'Siva is the greatest'. Kuresa added that ' Sivam was no doubt great but Dronam was greater than Sivam'- both expressions referring to units of measurement. The enraged king ordered both of them to be blinded when he came to know that he was Kuresa who was impersonating Ramanuja. Periya Nambi was tortured to death while Kuresa survived. Kuresa, though he himself was blinded, was happy that he had saved Ramanuja. It is this Kulothunga who is reported to have thrown away the idol of Govindaraja in the sea. Ramanuja recovered it and had it installed at Tirupati.